1869, and velocipede racing, indeed velocipedes themselves, was very much the novelty, having originated in Paris not long before, and their entertainment value was a good way to draw large crowds to sporting events. The first velocipede race in Victoria was at the MCG in July 1869. The bicycles, as shown in that link, seemed to have the advantage for racing over the comparatively ludicrous tricycle. 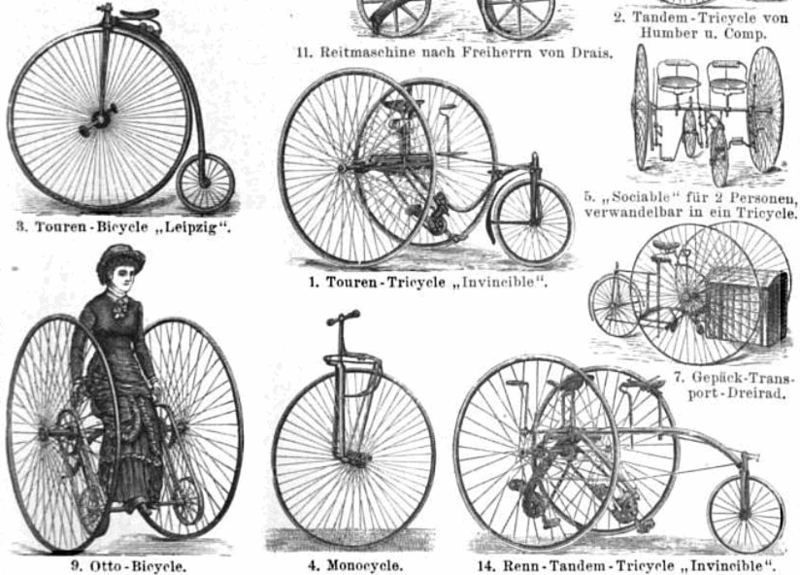 The illustration above is from a 1887 German encyclopedia, from Wikipedia Commons and give an idea of the variety of velocipede-styles available. Tricycles were popular with the ladies in the 1860s, being more modest and practical with long skirts. In the account below, Eveline and Flora seem to be mounted on tricycles, assuming the “guiding spindle” is a rudder-like handle like on this one. The “man’s velocipede” is probably a bicycle, which would give those entrants something of a advantage. The idea of offering a prize of ten guineas for a public race by lady velocipede riders was perhaps conceived by the promoters of the sports at Collingwood as a pure draw, without much expectation of edifying their patrons with the actual spectacle of a number of females tugging and kicking on the tricycle in public gaze. That six daring lady athletes entered the lists, and, of course, the publication of this startling piece of news brought shoals of all sorts of people last Saturday afternoon down to the North Fitzroy Cricket Ground, on which the trial of skill took place. Some three thousand persons waited through a weary programme of miscellaneous sports, and by half-past four, when the bell rang for the event of the day, the appetites of the spectators were well whetted. Five velocipedes were brought out and ranged in a row, at a chalked line on the turf, and speculation ran high among the bye-standers as to which of the ladies among them would come forth as the champions. The crowd clustered so thickly round the vehicles that it was evident there could be no race unless they retreated at the appearance of the ladies, for all the efforts of the police were in vain to clear the fair way. At last one young female, a blonde, of determined appearance, walked into the arena in very high soled boots, ankle petticoats, a hat very much down in the front — the “Girl of the Day” all over. A matronly attendant unswathed her of an elegant cashmere, and she bounded gracefully into her saddle, amidst the clapping of spectators. Off she went, on a trial canter, surrounded by a swarm of boys, who escorted her round the course with shouts. The Girl of the Day, however, was not to have a walk over. A buzz from the outskirts of the ring round the starting place gave it to be under stood that another lady was coming. She was preceded by a bearded protector, who intimated by winks and grins, as he elbowed his way in, that a clipper was at hand. The new-comer was horsily criticised when, clad in sombre black, she disengaged herself from the crowd. Tall and sinewy, she looked more than a match for the Girl of the Day. She had a man’s velocipede too, hand and foot, whereas the Girl of the Day’s was a comparatively namby-pamby affair, with nothing but a mincing pedal action. Clearly, she had no chance against the black demon. Yet another dark lady came forth. She was the only Missis on the programme ; and, as such, pleased some of the bystanders less and others more. In racing parlance, she was aged–decidedly, and an elderly chaperon, presumably her husband, pointed with glee to “the style of her, Sir. Only a week on a velocipede.” The Missis sported black satin, and vaulted with address upon an ugly truck called “The Governor,” to which she applied hand and foot, and surveyed the lookers on with glances of contempt, which showed that she was grin-proof. Toll, toll went the bell, wielded by a burly red-faced individual, who halloaed out between the peals “What’s keeping them ladies?” “Clear the cor-r-rse!”A fourth competitor came blushing into the circle. This was sweet Miss Eveline, of some eighteen summers, who was placed by a kind papa and carefully smoothed down on “Modesty,” an elegant article, but with no provision for gentle Eveline to hit out straight from the shoulder like the pair of blacks. Eveline looked very interesting as she sat with her hands upon the guiding spindle, but evidently could not put on the pace like the Girl of the Day, not to speak of the others who were eagerly sniffing the air. Half-a-mile was the distance, two and a half times round the green. Eveline had a companion in her temerity, Miss Flora, the youngest and prettiest of the party, who mounted a fiery red-wheelbarrow called Mazeppa. Flora’s colors were plum, with black jacket and cockahoop, and she looked very confident; But after sitting uncomfortably for a few minutes under the cross fire of jeers and laughter, poor Flora’s pluck failed, and she was lifted off the fiery steed, which they trundled away. All this time the bellman was getting frantic, and he obtained the assistance of three constables, who cleared a path before them only to be closed up just as quickly behind. The bellman consulted with the starter, an individual wearing black trousers with white facings, and carrying a big horse pistol. The result of the conference was that the bellman vociferated, “No race, no race! That’s all you’ve got. No race!” The ladies dismounted, the velocipedes were wheeled off, and a bicycle race which followed had the effect of sending away about two-thirds of the spectators. The remainder were rewarded for their patience by seeing all the competitors, except Flora, come forth once more. Crack went the pistol, and the black demon started, bumping away with a strong lead, and apparently enjoying the fun immensely. The Missis had her teeth set, and bent herself to the task with a will, but the steed did not respond to her punishment like that of the black demon. The black demon meant to win and no mistake, and the trainer of this petticoated jock ran capering along by her side with “Gently, gently!” “Mind that flag now!” and “Now’s y’r time!” The Missis had also her enthusiastic footrunner, who kept jumping out of the crowd from time to time, with cries of encouragement. Let us hope that the oft repeated “Go it old ‘un” from the bystanders was directed at him. And where was the Girl of the Day? Well, she went off a rattler, but only got once round. Dear me, the ground was so soft. She did not want any assistance, but drew off the course without dismounting. Eveline struggled along for about a couple of hundred yards, and then papa had to take her out, and take Modesty out of the way of the black demon and the Missis, who came spinning round again on their mad career, amidst an indescribable mixture of a cheer and a hoot from the crowd. Condition tells. The wiry demon came in first without turning a hairpin, and the spectators were fairly pumped out with laughter. So ended the first, and it is to be hoped, the last ladies’ velocipede race in Victoria. The remainder of the day’s sports were of a very uninteresting character.